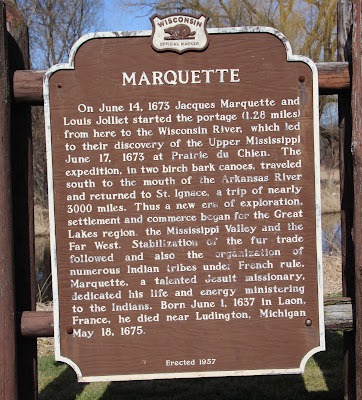 On June 14, 1673 Jacques Marquette and Louis Jolliet started the portage (1.28 miles) from here to the Wisconsin River, which led to their discovery of the Upper Mississippi June 17, 1673 at Prairie du Chien. The expedition, in two birch bark canoes, traveled south to the mouth of the Arkansas River and returned to St. Ignace, a trip of nearly 3000 miles. Thus a new era of exploration, settlement and commerce began for the Great Lakes region, the Mississippi Valley and the Far West. Stabilization of the fur trade followed and also the organization of numerous Indian tribes under French rule. Marquette, a talented Jesuit missionary, dedicated his life and energy ministering to the Indians. Born June 1, 1637 in Laon, France, he died near Ludington, Michigan May 18, 1675. 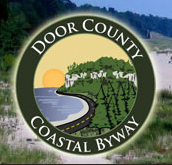 The marker is located in a small park on westbound East Cook Street / Wisconsin Route 33, just west of its intersection with County Road F, Portage, Wisconsin 53901. 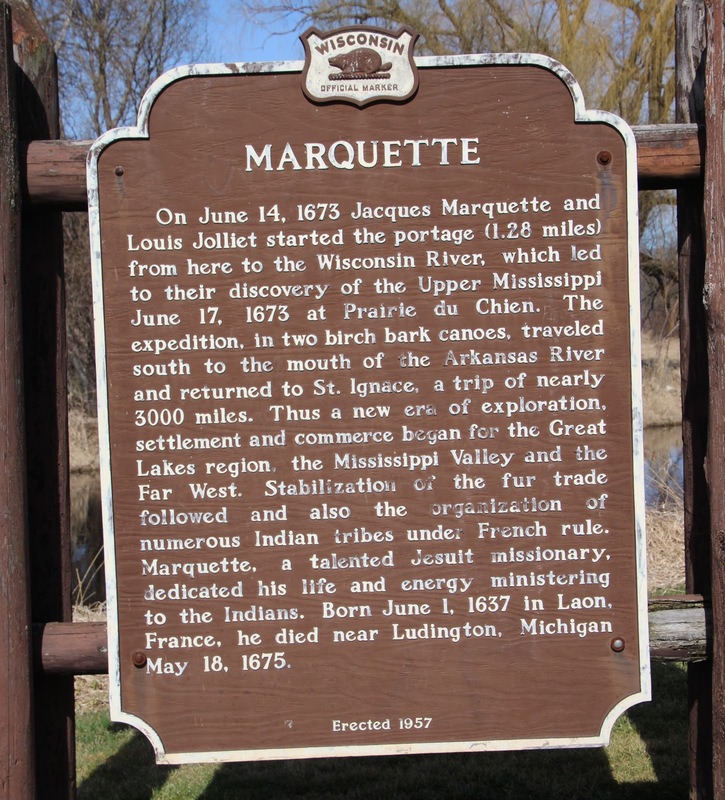 Use the "Pere Marquette" label below to view all markers on this website related to Father Marquette; there are many. The marker is directly across the road from Old Fort Winnebago Surgeon's Quarters. To Honor Pierre Pauquette (on the right), also at this location. View from the highway . . . The marker is a short walk from the parking area. View from across the road at Old Fort Winnebago Surgeon's Quarters.